Flourish is a group of believing moms who meet the 2nd & 4th Wednesdays, 9:30am-11:30am, and are committed to challenge each other to rely upon the Lord as we figure out this mom gig! The Spring Semester runs from January 9th to May 8th. Registration for Spring 2019 opens November 1st and closes December 7th. 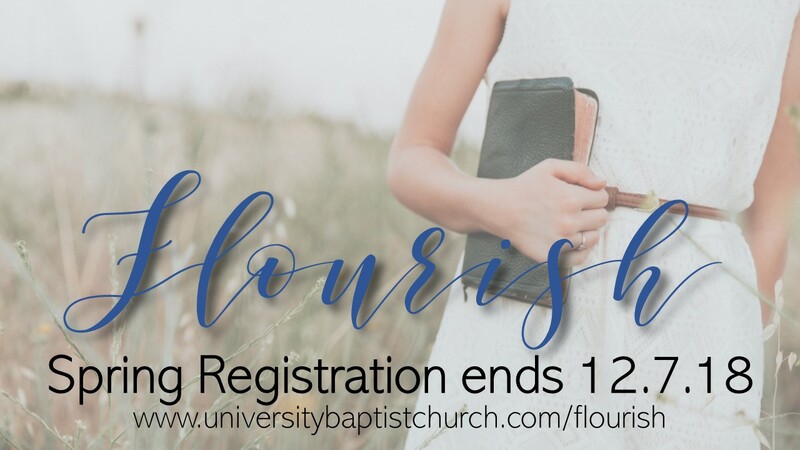 Please e-mail Flourish@universitybaptistchurch.com with any questions. We are Moms encouraging moms to know the love of Christ. With Jesus we become the women, wives, and mothers God created us to be. And with the help of the Holy Spirit, we bring up our children to know and love God too!